Location : 40 kms from Kota and 210 kms from Jaipur. Address : Ishwari Niwas Palace, Civil Lines, Bundi-323 001..
Hotel Description :It was built during the reign of Maharao Ishwari Singh to house the dewan of Bundi. 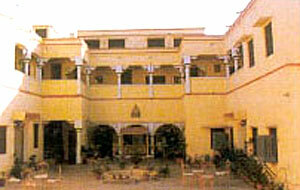 It was later turned into a guest house and today it is also the residence of Maharao's brother Maharaj Kesri Singh. A seventy year old building it is the combination of Indian as well as European style of architecture. The rooms inside have been furnished comfortably and all modern amenities have been provided. Accepted Cards :AMEX, VISA and Master Card. Services & facilities - Air-conditioned rooms, room service, running hot and cold water in the bathrooms, multi-cuisine restaurant, doctor on call, all major credit cards accepted here.